Anxiety is a combination of constant stress and fear that can hinder the enjoyment of everyday life. 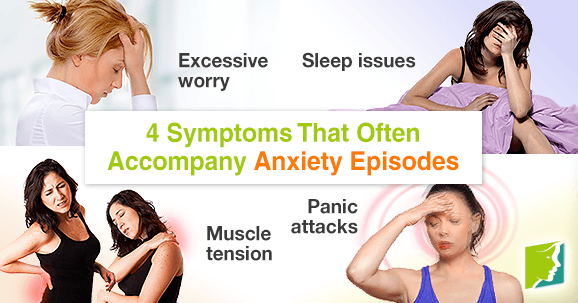 The symptoms of generalized anxiety disorder (GAD) come on more often for menopausal women because of the many hormonal changes taking place in their bodies. The word anxiety comes from the Latin angere, meaning to choke or strangle. This is a telling way to describe how restricting the symptoms of anxiety episodes may feel, but there are many ways to overcome them. This article will explore how anxiety may be affecting your life so that you can appropriately respond. Individuals with anxiety may find that they're constantly trapped in the worries of their mind. Instead of feeling at ease and thinking positively, one becomes wrapped in their fears, concerns, problems of the past, or trials of the future. The drop in estrogen causes a decrease in relaxing neurotransmitters (e.g., endorphins) and a rise in a stress hormone called cortisol. Optimism doesn't come easily to an anxious person, who's more often confronted with paranoia. Being in the moment is very hard for individuals experiencing anxiety, whether at work or in the presence of friends and family. Because of the surmounting concerns, sleep quality can be affected. In general, the hormonal fluctuations can affect your melatonin levels, which are necessary for a healthy sleep. When you are drowning in a sea of worries upon lying down to sleep, it can be impossible to get past them and fall into dreams. All of your concerns tend to amplify in the night and can make you stressed out about the littlest things. Insomnia will likely follow from excessive anxiety. When your mind is strained, it begins to show in your body. The lack of deep breathing and peace of mind can impact key areas of the body, such as the hips, shoulders, and forehead. This can lead to aches, pain, and even injury. Keep your muscles and joints relaxed by making sure to stretch and relax them at the start and end of each day accompanied by your deep breathing exercises. Panic attacks occur when your anxiety becomes so strong that your body thinks it is in danger. There is only so much worry that the brain can handle before it responds. Common reactions are sweatiness, shakiness, dizziness, hot flashes, nausea, increased heart rate, shortness of breath, and even screaming. It can be due to a single stressful event or the buildup of little stressors overtime. They can be intense and extremely unpleasant. Although the symptoms of anxiety can feel overwhelming, there are many means of managing them that anyone can put in practice. With mindfulness, relaxation techniques, and therapy, anxiety will soon be a woe of the past.